Razorback 15 is a modern stylish apartment with 2 upstairs bedroom's. The floor plan is reminiscent of a New York loft style with bedrooms on the mezzanine level overlooking the lounge area and out to the balcony. The lounge area is open plan to the kitchen and dining. Enjoy the comfortable sectional lounge with chaise to relax and watch the TV or enjoy a movie. You also have the use of Free WiFi with the apartment. Family meals and good conversation flow at the large wooden dinning table connected to the fully equipped kitchen. Warm or cool temps in the apartment are controlled by the reverse cycle air-conditioning and ceiling fans. Through the glass doors and sit out on the balcony enjoying a wine or beer in any weather you have central Jindabyne area plus gorgeous Mountain views. Just 3 doors up from the unit is Birchwood Cafe and across the street is Takayama Japanese Restaurant. These two establishments are at the top of the cafe and restaurant scene in the Snowy Mountains. Woolworths and Jindabyne retailers are all within a 2 minute stroll. 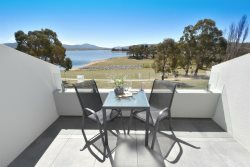 Razorback Apartments are the most central of all our apartments and are located in the same building as Ray White Jindabyne & Snow Escape Holidays. You can forget your car after a day in the mountains. The staff at Ray white were easy to deal with and more than happy to try and accommodate all our needs. We had a lovely stay. The apartment was warm and cosy. The location was perfect, right near great shops and restaurants. Thank you Peter and Joan. You made our visit friendly and the unit was just what we needed. Lot spacious and located very near with supermarket, restaurants, cafe, shops for ski hire and shopping! There is no better agent in town - the personal service is second to none! Joan and Peter go above and beyond to make sure that you have the most suitable accommodation, its clean and tidy and you have everything you need for your stay. Peter made checking in/out very fast & easy. Lovely place right in the centre of town. Open plan with the loft was great for a group. Easy walking distance from everywhere you need. We had a very comfortable and enjoyable stay.